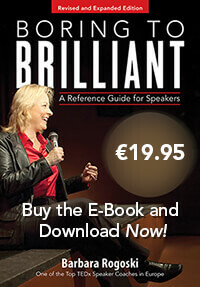 Buy the E-Book “Boring to Brilliant, A Reference Guide for Speakers” | Boring to Brilliant! Thank you for your interest in our Reference Guide for Speakers! You are welcome to purchase the ebook directly from this site. Click on the Purchase Button below to continue. The book is published in Adobe PDF format only. You can open it with your Adobe Reader, which you may download by clicking here. It is best read in double page view.